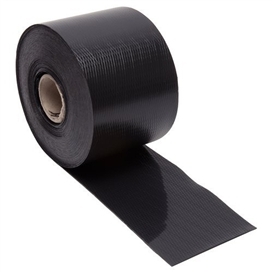 Beesley & Fildes Polythene Damp Proof course (DPC) is designed to prevent the passage of moisture in brick and block work from external sources. Available in 30mtr rolls in widths from 100mm – 600mm. Manufactured from high quality reprocessed materials to provide a cost effective and durable domestic grade damp proof course. For domestic construction use embossed to assist mortar adhesion. Proven performance over many years and safe and clean to handle.